New Zealand’s South Island was dreamier than my wildest dreams could’ve ever imagined. It was everything I hoped it would be & more. It was daily adventures in our camper van, driving through the night, parking by beaches, waking up to crisp dewy mornings & eating dinner by the lake. It was the most majestic magnificent magical landscape I’ve ever laid eyes on. Snow capped mountains that made my heart yearn for more adventure. Wide expansive mountain ridges that humbled me with their immense size. Crystal clear sparkling lakes that invited awe & peace into my curious soul. And mystical moss covered forests full of old magic & well-kept secrets which enchanted my disenchanted mind. It was Griff constantly losing things: our keys, his phone, his bank card, and everything else that’s possible to lose. It was Biggi keeping the peace and keeping us smiling. It was also realizing how little “stuff” I actually need. I practically wore 3 outfits the entire trip, and loved the simplicity of it. It was four phone calls that all impacted me and filled me with love when I needed it most. It was rock climbing, ice skating, fairy floss, hot chocolate, and movie nights in bed. It was cereal twice a day. ICE CREAM. Cinnamon rolls. Caramel chocolate. PENANG CURRY & burnt rice. Tahini on everything. Boxes of nutrigrain and coco pops everyday. And eating peanut butter with a spoon. It was being immersed in a thriving vegan community in Christchurch & befriending so many beautiful souls. It was pushing our bodies to the absolute limit & showing myself what I’m actually capable of. It was 8-12 hr days biking/hiking, feeling the sweat sting my eyes, my mind zinging with adrenaline, my body aching with fatigue & loving every sec of it. It was biking over 130 kms from Wanaka to Queenstown then back to Wanaka. It was doing a 3-4 day multi day hike called the Kepler track in one day. 60 kms of hiking through the mountains, 12 hours of non stop walking/jogging, and a stupid amount of peanut butter and jam sandwiches to fuel us through it all. 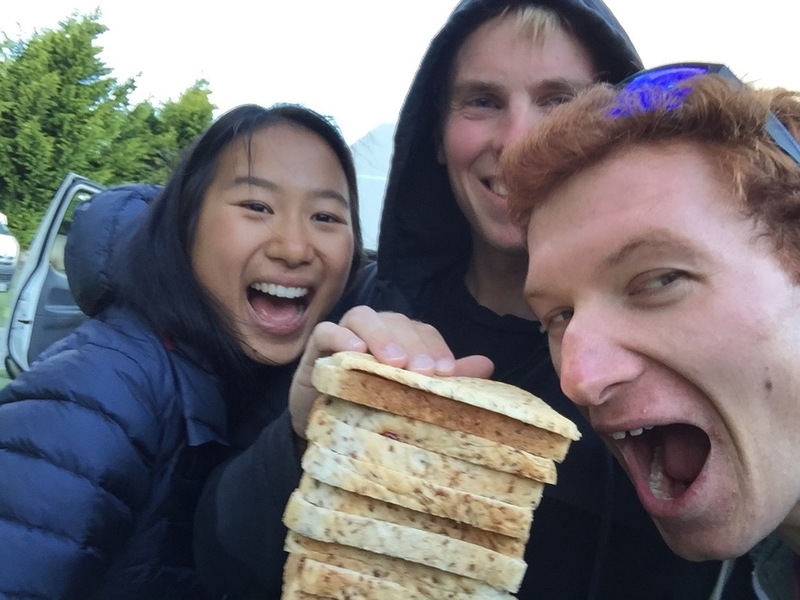 It was biking 175 kms from Christchurch to Akaroa and back, fuelled on dates and caffeine, and the buzz of a challenge. That ride was the longest and toughest ride I’ve done yet, full of crazy strong headwinds, and 2400 m of elevation. It was being mesmerized by the brightest fattest stars I’ve ever laid eyes on. The clear skies were littered full of infinite twinkling lights which shone down, bright as fire yet sweet as can be. Gazing up at them thrust my curious soul into action & my mind racing about what in the world is OUT THERE. It was peeing in bushes more than toilets, showering in gas stations, using hand soap for shampoo & doing laundry in the shower. It was lazy days of reading The Wise Man’s Fear, snacking non-stop, napping in the sun, contemplating the best cereal combos & late nights snuggled in our campervan talking about everything & nothing at all. It was spending all day everyday with Griff & Biggi & realizing that they’ve become 2 of my best most treasured friends. It was cereal parties in Melisa’s kitchen. And pizza parties at Loren’s house. It was going to bed everyday utterly exhausted from just living life, which is exactly how I want to feel at the end of everyday. I want to just live the hell out of this life I’ve been given.